Ensuring that a small and concealed area is cleaned thoroughly can be a difficult task, especially when hazardous or chemical materials have been contained within the area. At Mantank Environmental Services, we understand that finding the right industrial tank cleaner to work with can be hard, especially with so many new start-ups within the market. 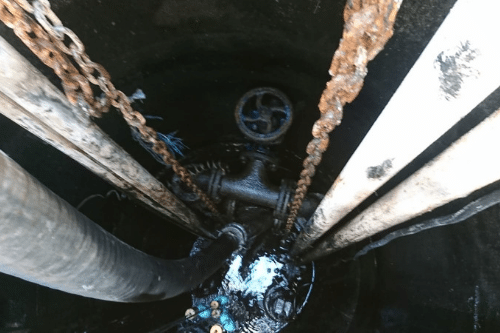 However, when looking for a team that specialise in confined space tank cleaning, it is essential to review their experience and knowledge within the industry. Having a portfolio of clients behind us and extensive experience in working on non-entry and confined space tank cleaning projects, we are the chosen provider for clients throughout the country. Confined space and vessel cleaning require a qualified team to ensure that the work is carried out to a high level. Failure to ensure that all traces of the material are removed from the tank can result in decontamination, which impacts on your entire production process. Our team of professionals have years of experience in working on these complex projects, ensuring that each result exceeds client’s expectations. We work alongside our clients to understand their exact requirements and how they require the work to be carried out with minimal disruption to their working day. Our background in the tank and vessel cleaning industry means that we have the skills and expertise to ensure that the works are carried out in a limited time without impacting on the quality of the clean that we carry out. We have also invested heavily in our kit, as we understand that this is at the very core of our services. We have researched and tested numerous different confined space tank cleaning equipment types to find the best solutions for our clients. By combining our years of experience and this investment in our equipment, we are able to provide sought after non-entry tank and vessel cleaning services. Our clients range from industrial sites that require a one-off confined space tank cleaning service, through to national organisations that need industrial cleaning on a regular basis. We are passionate about providing great customer service to all our clients, whatever their requirements. We work throughout the UK, from our 3 depots, with clients that have a requirement for a specialist tank, industrial and vessel cleaning team. Whatever your requirements, our team are on hand to help. Alongside our tank cleaning services we also provide a range of drainage and environmental services that can be found via our website. To find out more about our confined space tank cleaning services get in touch with our professional team. We have years of experience in working on complex and intricate tank cleaning projects. To speak to a member of our team simply fill in our contact form and we will be in touch as soon as we can.